Coauthors Nancy Feehrer of Westford and Boston Marathon race director Dave McGillivray of North Andover. Boston Marathon race director Dave McGillivray has run 155 marathons including 45 straight in Boston, completed the Ironman World Championship in Hawaii nine times, and finished numerous endurance races for charity. 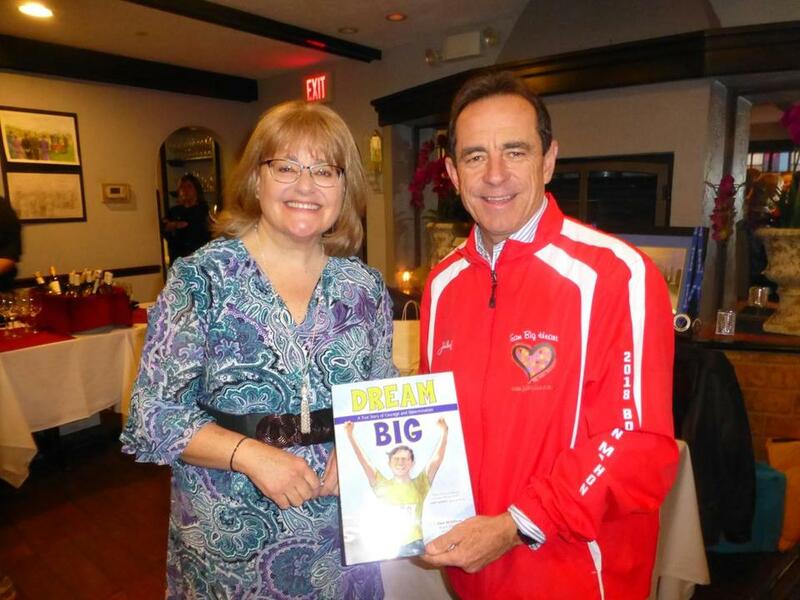 With the publication of his new book, “Dream Big: A True Story of Courage and Determination,” by Nomad Press, the North Andover resident has added children’s book author to his lengthy list of accomplishments. The adapted 30-page story recounts McGillivray’s childhood dream of being a professional athlete despite repeated rejection from coaches and prospective teammates due to his small stature. It was written with teacher and writer Nancy Feehrer of Westford and illustrated by Ron Himler of Arizona. McGillivray began running at age 12 and attempted his first Boston Marathon five years later in 1972. When lack of training forced him to drop out at mile 18, he vowed to put in the hard work to achieve all his future dreams. Feehrer was in the audience when McGillivray shared his motivational story two years ago at Abbot Elementary School in Westford. Shortly after, the pair partnered on the book in order to more widely share his message of resilience while coping with doubt, disappointment, and loss. As further encouragement, the last page of the book presents the Dream Big Marathon, a challenge to become physically, mentally, and emotionally fit by running 26 miles, reading 26 books, and performing 26 acts of kindness in 26 weeks. McGillivray, owner of race and event management organization DMSE Sports Inc., continually sets the bar higher for himself as well. Last month, he conquered the World Marathon Challenge by completing seven marathons on seven continents in seven days. In addition, he has already completed the manuscript for his second in a series of six planned children’s books. For more information, visit dreambigwithdave.org.